Brendan Shields AKA Mr.Payne wearing Wil's iconic bowler hat at the beach. Brendan Shields is the son of Kieth Shields a long time friend of Wil Hudson. 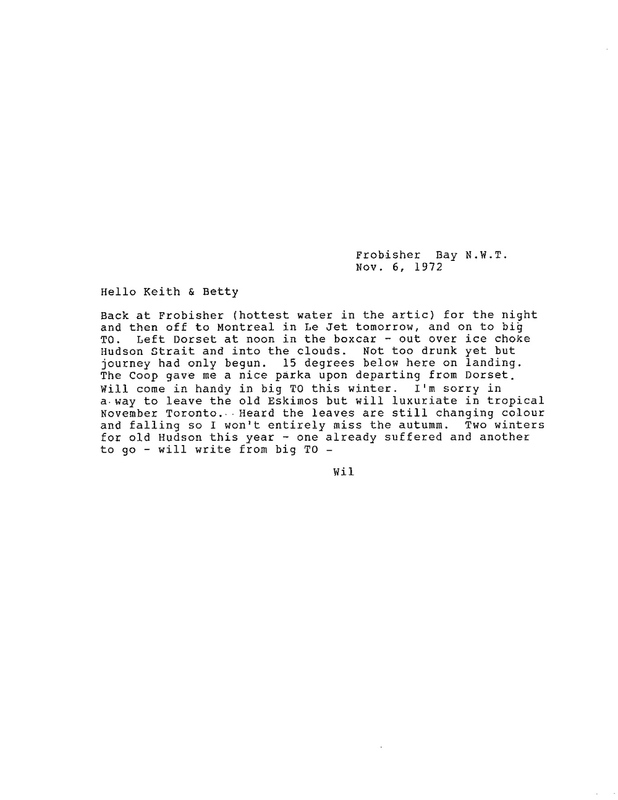 While Wil was in Cape Dorset he corresponded with Brendan's family offering an inside glimpse into Wil's experiences. 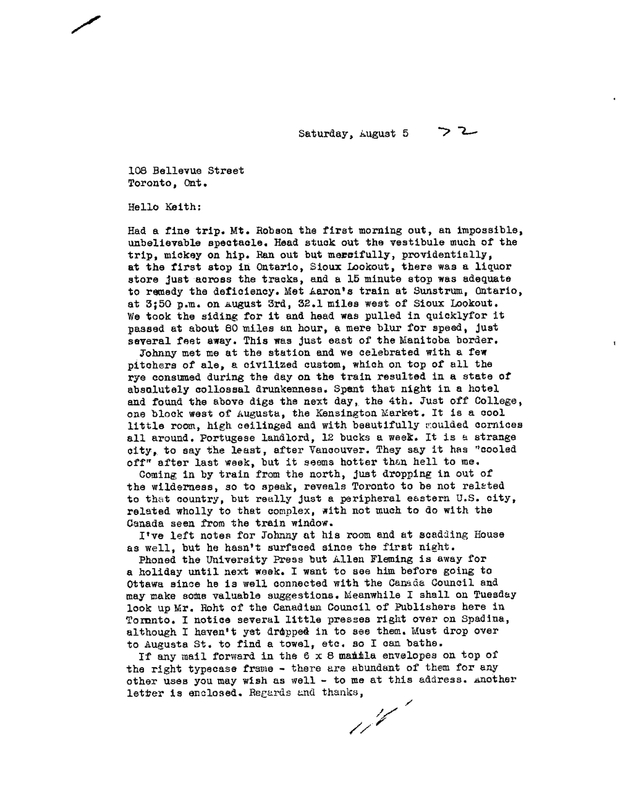 Brendan has offered to share his correspondence here to help give Wil his own voice and perspective. Interestingly Brendan had to preface his offerings with a glossary of terms which just added another layer to Wil. I received this email message Dec.19th 2014, really good of Brendan to share these with the world. Just to clarify, these letters are unedited so Wil's opinions are characteristically politically incorrect at times but that should not over shadow the richness and thoughtfulness of his ideas and observations. Bil Shoebottom another family friend of ours who Wil grew fond of. Harold, France's and Wendy, all Sean's family. Let me know if you have any questions it is quite a rich read. 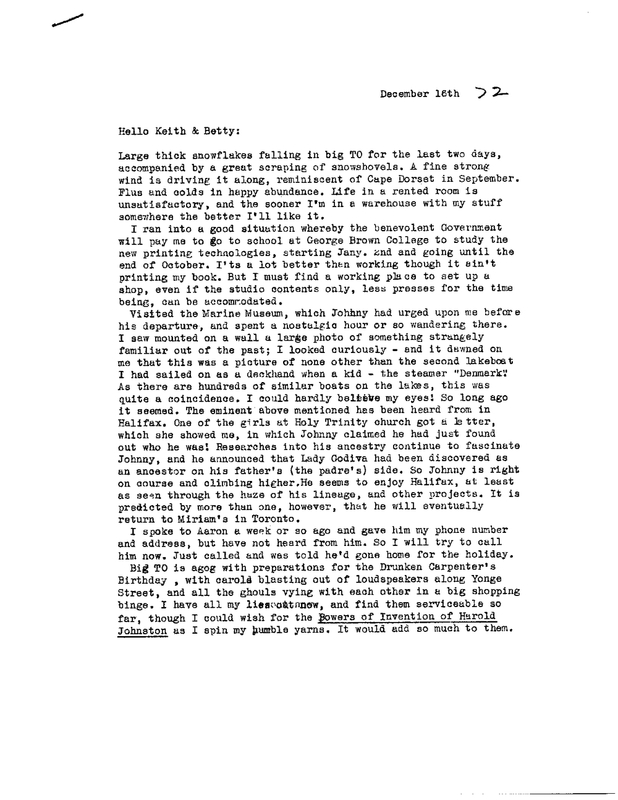 I will use scans of the actual typed letter or portions of the letters because I really like the "look" of the source material. If I can't use the actual letter I will re type the portion and credit the quote to Brendan so you will know the source. The first mention of the ill fated project that Wil and the Alcuin Society were attempting to accomplish. It was the Settlers Guide that you can see in Shean's photos. Things get more clear as the letters move on. Another reference to the Alcuin Society. Perhaps they still think Wil is in BC and not in TO looking for work? Another reference to the Alcuin Society snooping around. Famous Wil quotes" Indeed the comfortable of the world seem in little haste to contact the uncomfortable". 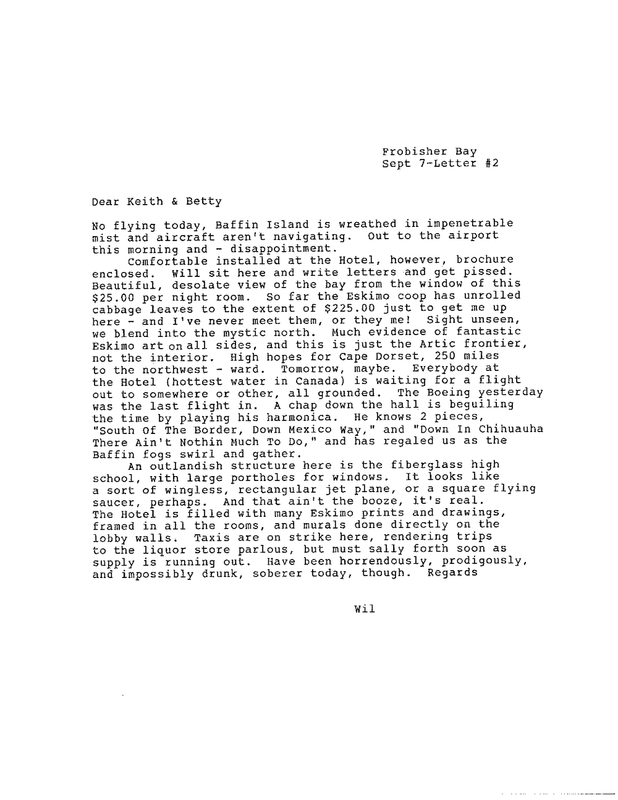 The big break, I used this letter in entrity because it clearly shows how excited Wil is to have landed this job in Cape Dorset. Obvioulsly Flemming is i contact with Terry Ryan.